Liverpool striker Luis Suarez has apologised for his "inexcusable behaviour" after biting Chelsea defender Branislav Ivanovic. The incident occurred in the second half of Liverpool's 2-2 draw against Chelsea at Anfield on Sunday. "I've spoken to Ivanovic on the phone and I could apologise directly to him," Suarez tweeted. "Thanks for accepting." 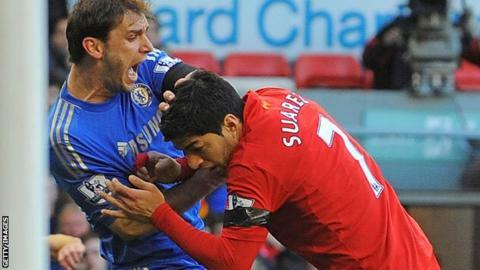 "What Luis Suarez did has absolutely no place in football and he is going to get - and deserves - an extremely lengthy ban. "You cannot bite people anywhere, let alone on a football field. It is the type of thing you do when you are a baby. He's a world-class player but he gives you world-class trouble." In an earlier statement, he said: "I apologise to my manager and everyone at Liverpool for letting them down." Blues defender Ivanovic, 29, complained to referee Kevin Friend that he had been bitten on his right arm by Suarez after their clash inside the Chelsea penalty area. "Having reviewed the video footage and spoken to Luis, his behaviour is unacceptable and I have made him aware of this," said Reds manager Brendan Rodgers. Ian Ayre, the Premier League club's managing director, added Suarez's behaviour did not "befit" that of a Liverpool player. "Luis is aware that he has let himself and everyone associated with the club down," said Ayre, who cancelled a planned trip to Australia to personally handle the fallout. "We will deal with the matter internally and await any action from the Football Association." Shortly after the match had finished, Rodgers pledged to review the incident and promised that no individual was "bigger than the club". "This is a club with incredible values and ethics," he said. "There's certainly no-one bigger than this club, a player or manager. It is not the first time this season that Suarez has been criticised by Rodgers. The former Swansea boss was angered by the striker's admission that he dived during a game against Stoke. "Diving is not something we advocate," said Rodgers said in January. "I think it's wrong. It's unacceptable." December 2011 - Given eight-match suspension and fined £40,000 for racially abusing Manchester United's Patrice Evra. February 2012 - Refuses to shake hands with Evra at Old Trafford and is described as a "disgrace" by Sir Alex Ferguson. October 2012 - Accused of diving by Stoke manager Tony Pulis. November 2012 - Accused of stamping on Dave Jones by Wigan manager Roberto Martinez. January 2013 - Mansfield chief executive Carolyn Radford says Suarez "stole" their FA Cup tie when he scored after using his hand. Former Ajax captain Suarez, who scored his 30th goal of the season in Sunday's draw, has bitten a rival on the pitch before. The Uruguayan international, who signed for the Reds in January 2011, was given a seven-match ban for biting PSV Eindhoven midfielder Otman Bakkal during a game in November 2010. Suarez was recently named on the PFA Player of the Year shortlist. Professional Footballers' Association chairman Gordon Taylor believes Suarez will not be excluded from the PFA award but called the situation "embarrassing". Taylor told BBC Sport: "It is very depressing and embarrassing that it should happen. If it wasn't for all the controversies he's been involved in, he would be a more highly regarded player. "Players are role models and are highly rewarded. This sets such a bad example." Chelsea goalkeeper Petr Cech said Ivanovic had not mentioned the incident with Suarez immediately after the match at Anfield. "I didn't see it at the time," said the Czech Republic international. "Suarez always does little fouls and pushes. I saw Branislav's reaction and he was not happy at all."